Outdoor Education - Students in grades 1 through 4 experience outdoor education each spring. Activities include science and wildlife exploration, archery, zip-lining, and water activities. Most recently this event was held at Camp Lone Start in La Grange. Debate Competition - Middle School students have the opportunity to develop and showcase their debate skills in debate competitions. Math Club - Reverend Gaub, middle school teacher, encourages students in grades 6 to 8 who have an interest in math to join the after-school club that meets on Fridays. The group participates annually in the national MathCounts competition. MLS has received Silver status recognition. This is a great honor, as our school is new to the MathCounts program. Spelling and Geography Bees - Memorial Lutheran School participates in the national spelling bee (Scripps) and geography bee (National Geographic GeoBee) competitions. Grades 1 through 8 hold class spelling bees, then we have the School Spelling Bee with that winner moving on the regional bee. For the National Geographic GeoBee, students in Grades 4 to 8 participate in a class bee, then the school bee, with that winner moving on to the state competition. Academic Quest - Academic Quest is an annual middle school completion hosted by Lutheran High North where Lutheran and other private schools meet for a day of academic fun. Sixth though eighth grade students participate in various grade-specific and open events. .Each year our MLS students win individual medals and ribbons, and team trophies. Bible Bowl - Students participate in a Bible knowledge team competition with other Lutheran schools in the Houston area for grades 5-8. National Junior Honor Society - National Junior Honor Society (NJHS) membership is open to middle school students who qualify academically and who also exhibit dedication and positive leadership. The students will work on various social projects throughout the school year. For information on NJHS visit their website. Art Lessons - Students in elementary and middle school levels have the opportunity to work with the art teacher after school, and will complete several art projects. There is an additional cost for this class. Piano/Violin Lessons - Private lessons are available in piano and strings (these classes fill in early fall). There is an additional cost for these private lessons, and is paid directly to the music instructor, Children in Kindergarten and higher are eligible to sign up for lessons. 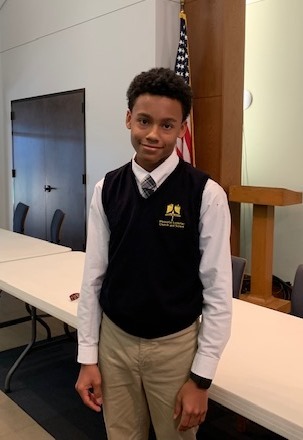 Noah Valencia - 2019 MLS Spelling Bee Champion, runner-up in the private schools bee, moved on to the state level Bee.